Sussex have appointed former England assistant coach Richard Halsall as Academy Director. Halsall will arrive at The 1st Central County Ground with a wealth of coaching experience at all levels of the game. His most recent roles have been with the Bangladesh national side. He was the country’s fielding coach from 2014 before becoming Assistant Head Coach in 2016. Prior to that, the 49-year-old was employed by England as their Assistant Coach and Lead Fielding Coach. He was with the team when they won the ICC World Twenty20 in 2010 and during three Ashes series victories both at home and in Australia. 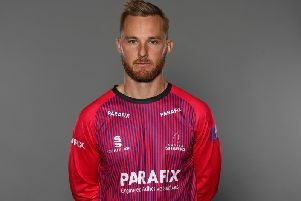 By coincidence, the man Richard will replace at Sussex Cricket, Carl Hopkinson, is moving on to become the ECB’s Lead Fielding Coach. Carl is leaving Sussex at the end of March, with Richard due to take up the Academy Director position from 1st May. Richard will be no stranger to Hove having been Sussex’s Fielding Coach from 1998 to 2006 and in charge of a number of the county’s age-group sides beforehand. The Cambridge University graduate has also been head of the physical education programmes of two schools renowned for their sporting excellence, Brighton College and Wellington College. Commenting on his appointment, Richard said: “I’m delighted and honoured to be joining Sussex Cricket at a time when the significance of the Academy is critical to the health of the club and I will look to build on and continue the excellent work Carl has already done. Sussex’s Director of Cricket, Keith Greenfield added: “To secure the services of someone with Richard’s experience, quality and passion as a coach is a massive addition to our staff. “He has worked successfully as a coach at every stage of the performance pathway, including at school, county and international levels, and will be an asset when it comes to building our future alongside Jason [Gillespie, Sussex Cricket Head Coach]. “Our youth and Academy players will have an Ashes winning coach who is desperate to get to work in creating future Sussex and England players. As a player, Richard played nine first-class and five list-A matches in his native Zimbabwe and England.